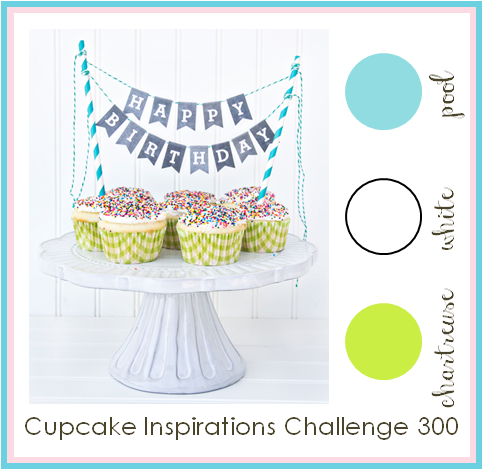 This week is a fun week over at the Cupcake Inspirations Challenge Blog! They are celebrating their 300th challenge with tons of fun prizes (including one from us at Newton's Nook Designs). They are also hosting 3 challenges throughout the week. Today is the second challenge and is a COLOR challenge based on the above photo. I love this color combo! Lydia really made it pop by using mostly white with bright pops of the "chartreuse" and "pool". She used our stamp image of the cute kitty in a gift bag from our Newton's Birthday Bash Stamp Set. I love that paper piercing with the fun chevron paper! So cute! Such a cute CAS card! And I love this color combo too, so pretty! i love this color palette, the card came out so beautiful! Awww what an adorable card. Thanks for sharing. Super cute card!! I love the colors!! !